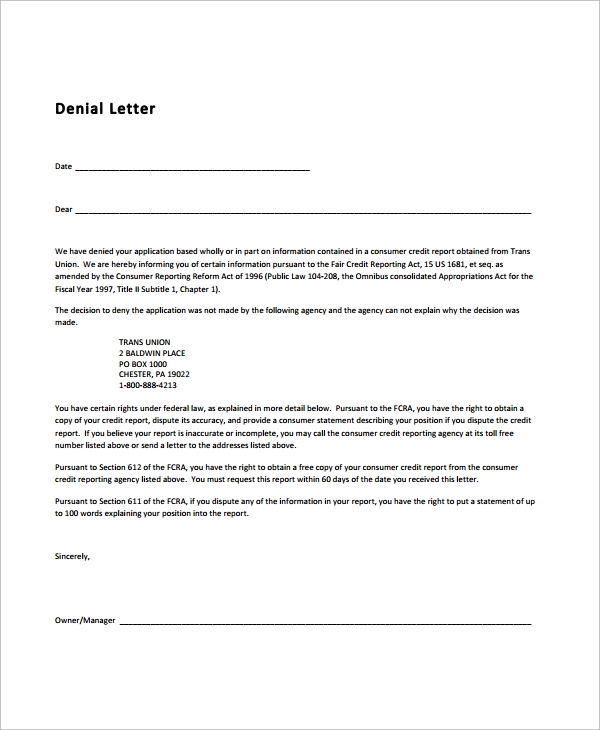 A denial letter is written when one needs to deny a particular application by a person. 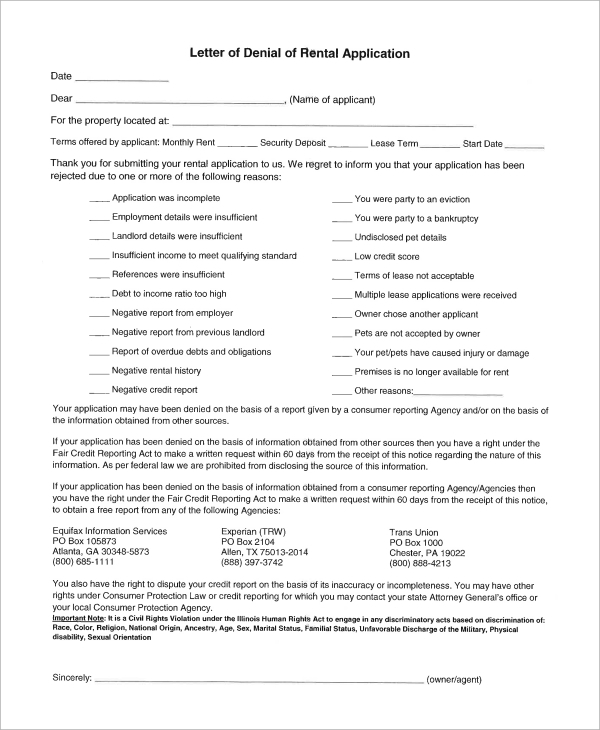 A person may ask for scholarships, or claim for insurance which is false and try to get college admissions which the receiving party has the right to deny the request. While writing the denial letter the proper justification along with denial should be mentioned. It should give the person time to respond to the denial letter. 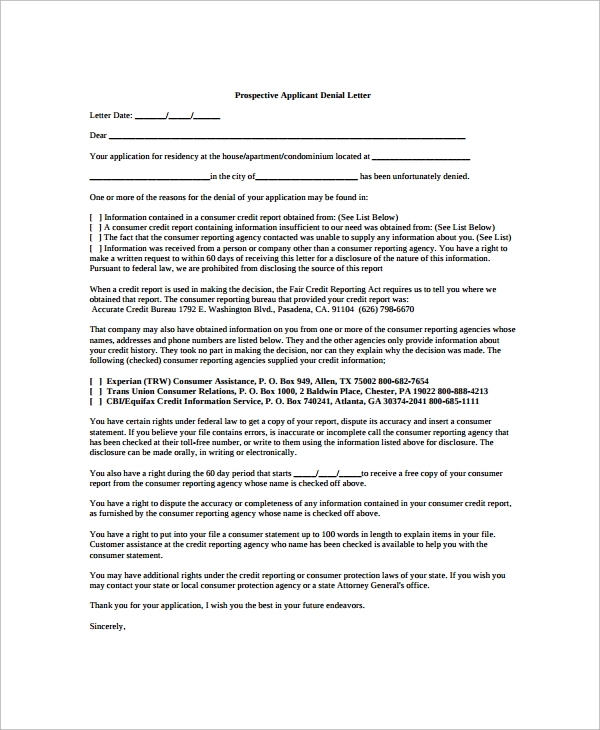 You may also like Application letters. A consumer will apply for various services like personal or home loan. The giving bank will check his current status and also based on credit ratings and other criteria a consumer can be denied the loan. 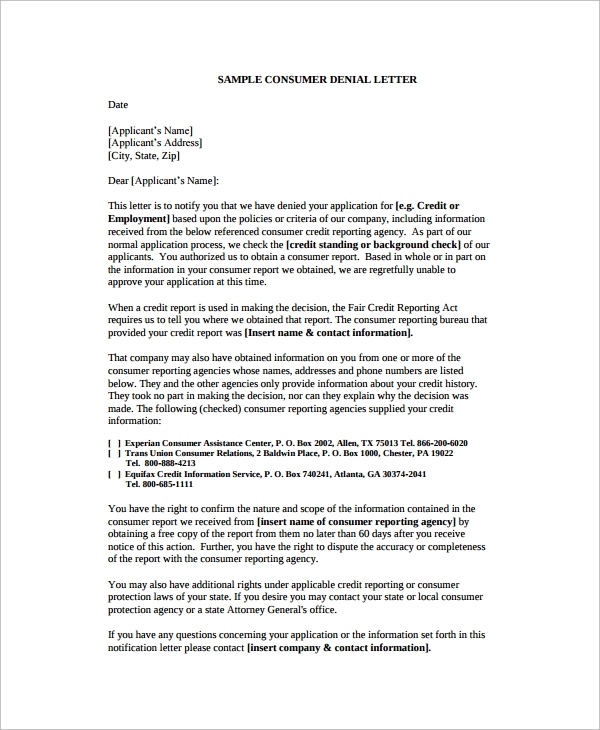 This type of letter is called consumer denial letter. It justifies the denial of a service. Claims are made for insurance. It could be life insurance or other insurance like health or automobile insurance. A person having an insurance can claim for the amount which one is insured. The insurance company will check all the necessary details and feels he has not satisfied any of the conditions will deny his claim. 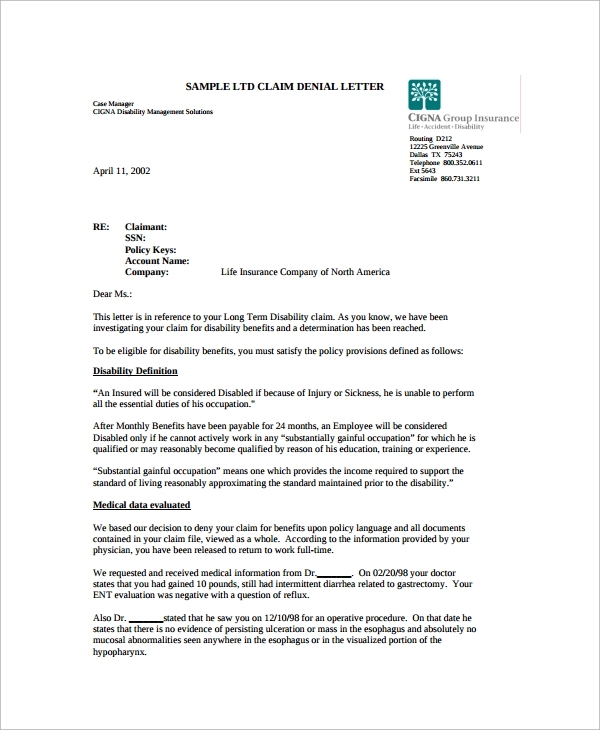 This denial is sent in written format to the customer and referred as denial letter for claims. 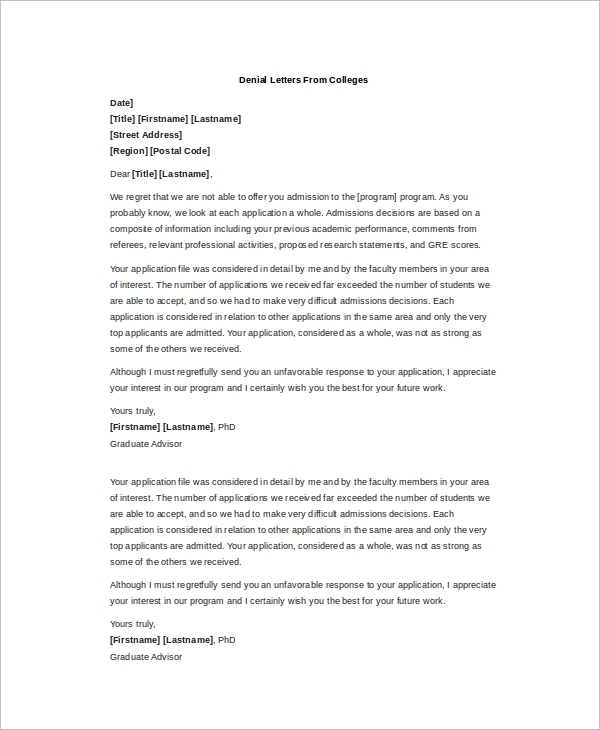 A denial letter from college is generally regarding admissions to a particular course. The course admission will be based on a number of factors like marks in previous examinations and other aptitude test taken. The student can be waitlisted and provided admission on an availability of seats. In case the student is deemed unfit then a denial letter is sent from college refusing admission. Grants are provided to college students for a project which needs funds to complete or scholarship to study in college. A grant will also have a number of criteria for giving it to the eligible. 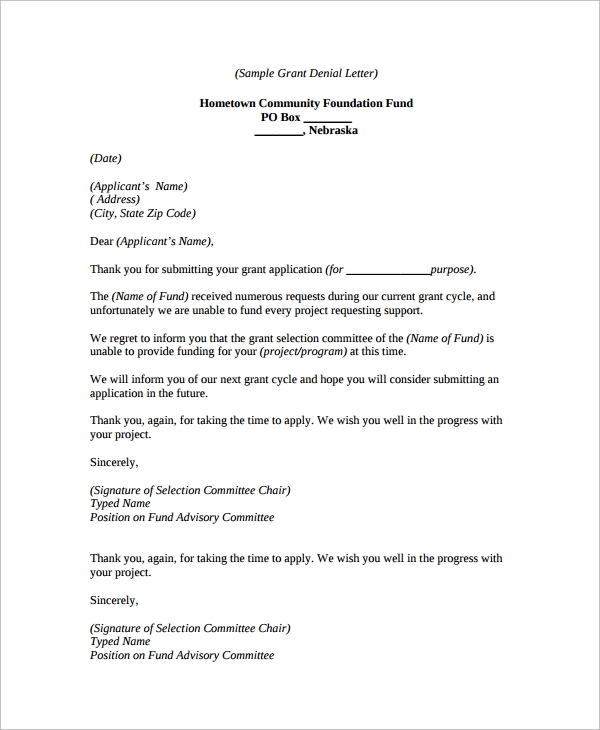 In case these conditions are not met then a grant denial letter is sent out to the applicant. He may appeal the denial within a stipulated time. Denial letters are written for the sake of denying particular services like college admissions, scholarships, insurance and others. This formal written communication method gives a clear communication to the person. The person has a clear idea why the request was denied and he can take action to resolve the same. The person has a given time frame where he can protest against the decision. He should also have strong evidence of the facts to counter the denial. You may also like Letters of Recommendation. 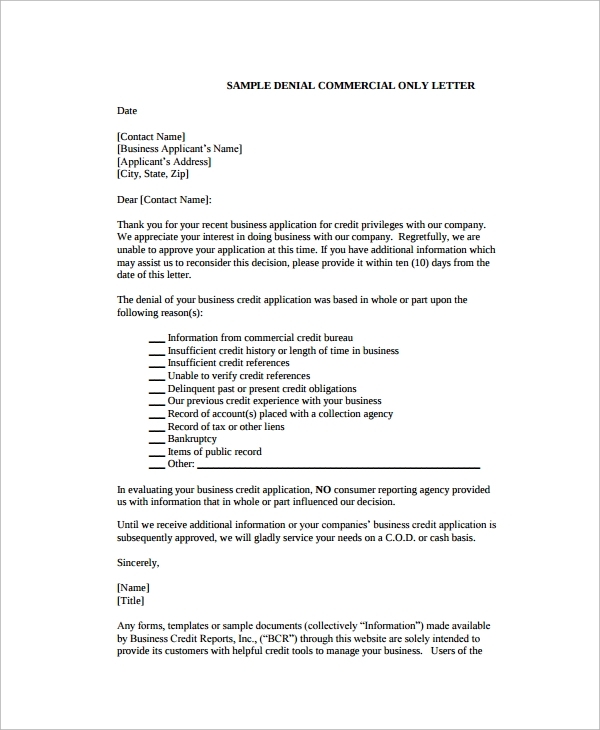 Templates are available along with word processors like Word. There are free denial templates available on the internet. We can download the same and use it. We can customize the same and put the content which is relevant for our organization. A denial letter should be on a letter head. It should be addressed to the person along with his name and address. It should address the person and then have the format or content for disapproving the request. It should give time for the person to respond back or claim for the approval once more. It should have the contacts of the person writing the letter. You can also see Student Reference Letters. 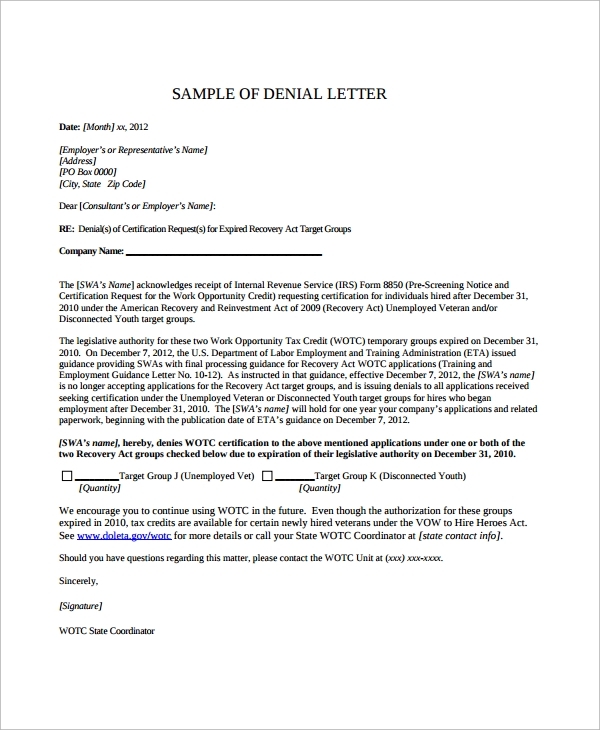 We have different types of denial letter available for download. It is available in word document format and also in pdf documents. In case you need it in any other format please contact us and we will be happy to provide the same. You can download the templates and use it for your needs.